Can I buy the Shadow Stalkers novellas in paperback? Yes. The Shadow Stalkers were originally released as novellas as part of paperback anthologies and those anthologies are still available. 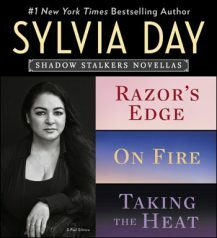 You can find ordering links for the paperback anthologies containing Razor’s Edge, Taking the Heat, and On Fire on each novella’s individual book page. What is the correct reading order for the Shadow Stalkers Mini-Series? The novellas in the Shadow Stalkers Mini-Series are listed below in the order they were originally published.